I thought I was having an epiphany. I was thinking what a great idea it is to write your own obituary and how I could create a website, kind of like an on-line safety deposit, just for autobiographical obituaries. There are already over 2 million sites related to writing your own obit and a few that will store them. Perhaps mine can include recipes to share from beyond? This Asian Zucchini Salad recipe combines flavourless grape seed oil with super-smokey sesame seed oil. If you sprout your own mung beans, give yourself 4-5 days head start. Toast seeds and peanuts in a 350F oven until they brown a little. In a small bowl, mix the oils, vinegar and salt. Taste to adjust for acidity. Combine the green ingredients just before serving. 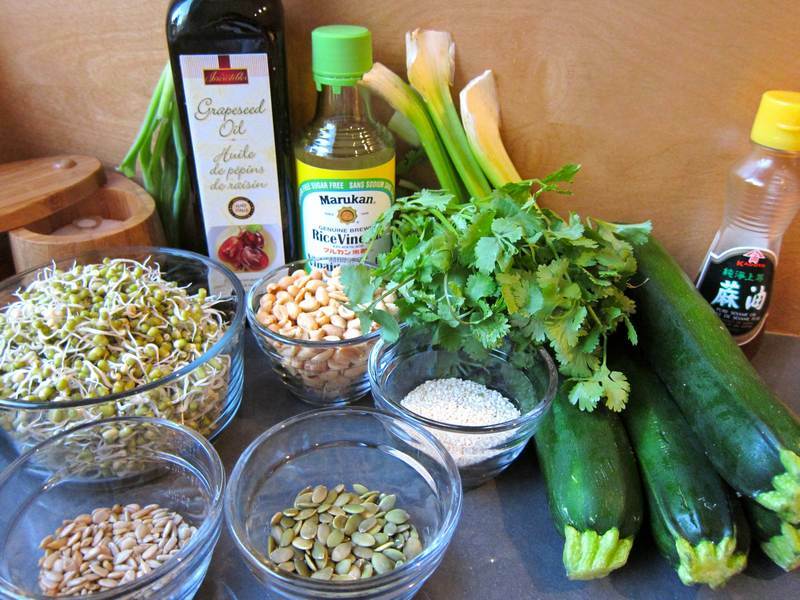 Mix zucchini, sprouts, scallions, fennel and coriander in a medium-large bowl. Toss well, but gently, with the dressing. Arrange on a large platter. 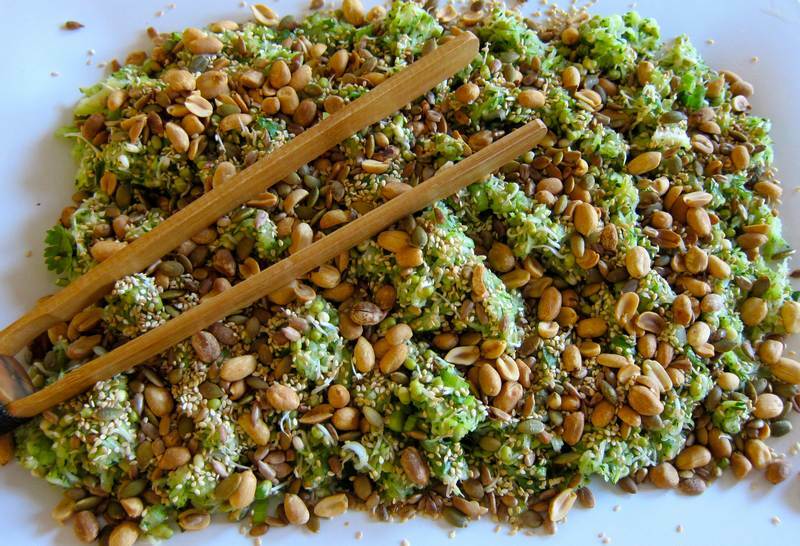 Scatter the nuts and seeds on top for a lovely presentation. Just before the first person digs in, gently fold in the nuts and seeds to mix them in with the other ingredients. If you still have zucchini to cook, have a look at these Zucchini Fritters from Jeanettes Healthy Living. Check out Planned Departure as a cyber-place to store your vital info. Thanks to Anne, the splendid chef from Centre Tara, for divulging the ingredients to this wonderful dish. Thanks to the Richardson gang for tasting and liking Asian Zucchini Salad. I hope the Shri yoga group will let me know if it holds a candle to Anne’s version. When is the last time you had truffle oil? The Truffle Oil Salmon Tartar at Lemeac is to die for. Got some new and unusual way to feature truffle oil in a jittery recipe? 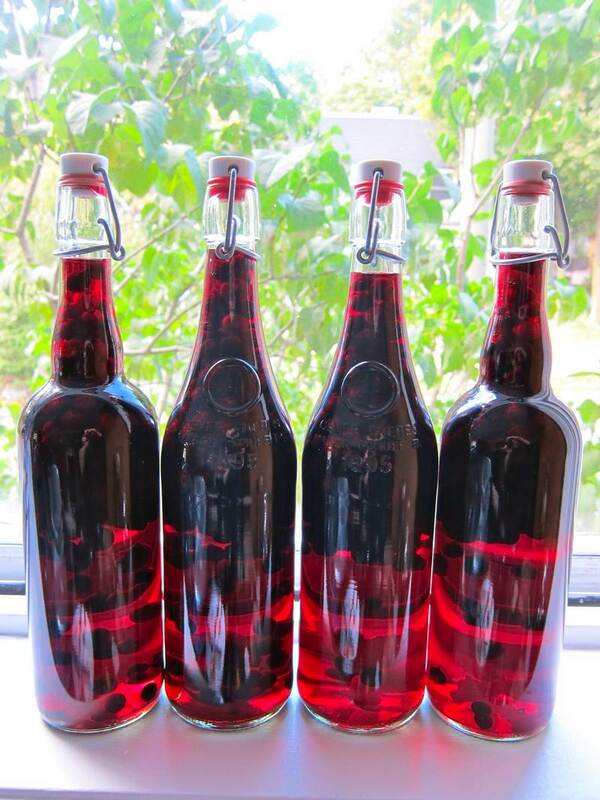 A bottle of this infused alcohol will be the 2012 holiday season Jittery Cook prize. What can you do to win? Email [email protected] your favorite recipe to share. Deadline is December 18. Good luck! Always fun to think we thought of something original or even that we are unique. Happy Birthday little sister. I hope u have a great day and do something special, cause YOU are! Love to the family. Aloha. Eric Botner President / Founder http://www.earthcircleorganics.com 530 263 4878. Thanks big brother. I mentioned your raw chocolate in today’s recipe2recipe Chocolate Nut Butter Bark recipe. Thanks for the good wishes and for thinking I’m special! Hi Holly. This looks YUMMY! ……And if you are rushed and want an easy dressing?? Find your way to Cavallaro Stores, Real Bagel on Queen Mary, and The Atwater and Jean Talon Markets to name a few and pick up some ChefAndy vinaigrettes! Thanks for the tip! And for liking the recipe! Dad started chemo today and he loves this salad. It’s the only thing he wants to eat. Thank you jittery. Oh and he had to share with my 5 year old girl…imagine that. It’s so refreshing and before you ask….no i didn’t sprout my beans, Healthtree did! What a beautiful salad. The crunch of all the different types of nuts and seeds looks just wonderful. It is very different. I wish I knew all the cooking secrets of that chef from Centre Tara. She is a natural. You know the type that doesn’t require recipes?